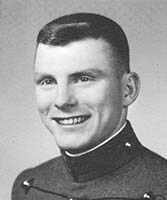 View a eulogy for Daniel Joseph Coonan, USMA '66, who passed away on February 17, 2017. Friends and Family of my Dad. Below is the text of remarks I made at the cemetery just before the military honors were given. Thanks, Father. Thank you for making journey here to be with us; I want to make a few remarks about Dad. Dad remained a mystery to me for a long time; I longed for greater connection and to know more of "who he was" -- I spent years imagining his young life. It wasn't until I entered my own career that I began to gain some understanding. We began to talk about history, the military and the greater things of the nation. We set aside politics. We found togetherness in our living room and kitchen looking at his two volume West Point history of military battle and campaigns -- first the maps, then the leaders -- I reached an understanding of the institutions that shape men, institutions like West Point. I read "The Long Grey Line." It was an important moment for me as I know it was for many of us here. I finally saw the era Dad lived in and glimpsed his emergence into manhood. I gleaned Dad's ambitions and commitments -- where he obtained his incredible focus and unrelenting will. Dad began to tell me stories. About West Point: The Man with the Red Sash, Beast Barracks, the glorious abduction of the Navy Goat (sorry to those in the Navy here !) and the class slogans -- one a chide -- "With milk and fruit, we'll get our kicks"; the other a prognostication: "Fame will Mix with '66." It seems it has. I loved him for the stories; I began to feel connected in a new way. I sought his counsel in times of trouble or uncertainty at work. He continued, in a new way, to teach me. One of the funniest stories to me is when he served in the South Pacific in 1968 in Okinawa. He had written my Grandfather, who was also serving in the region, that he could not "get a date". Mom, who had just graduated from UT Austin, signed up to teach in the DoD programs. As I was told, the young officers would head to the tarmac when they heard a new group of teachers were arriving from the States. When he saw Mom, a beautiful blonde from Texas, get off the plane he forbade anyone else from dating her. Then...Mom could not "get a date." He just tagged along with Mom's group -- to her annoyance -- until they fell in love. I don't know if he pulled rank on the other guys, but the rest is history. When Mom found out later in life, she was none too pleased! But, he will always remain a mystery. So, I will continue to imagine him. I think the imagining by sons of fathers is mythic -- for me the imagining is a source of love. Here is some of what I have learned of him through this process over the years of his life. Humility. Over the past months, as Mom, Rebecca and I have sifted through the past in our mourning, Mom found a document with a recommendation for Dad's promotion to Lt. Col or Col. I'm not quite sure which. The General said: "Dan is the most talented Combat Control Officer in the Air Force today. Promote him immediately." We all finally had evidence of something that we had long known -- his brilliance and creativity. It was healing. Humility. How is one to remain humble given such high praise and accomplishment? If there is one thing that stands out most about Dad, it is his humility. He remained forever in awe of his classmates, and Rebecca and Me. Dad saw himself as part of something greater: the nation. He was a quiet professional. Yet, it went beyond -- far beyond -- patriotism; his selflessness flowed out into our family and profoundly shaped Rebecca and me. He loved us; we loved him -- and we deeply admired him for his selflessness, his humility. At times, it was unbelievable. He rarely complained, even when he should have. At times, he suffered silently, yet not without reason. He did not think his suffering was special, and he wanted us to know he was okay. He understood the tragic nature of life. I believe his humility found its source in a faith in something greater than himself. I was with him in the last moments. Those memories will never leave me. And for Mom and Rebecca, it must be the same. What I remember most was how much we loved each other. We kept saying it. He showed such courage. I will say he grew his strength at West Point and with the Combat Controllers of the Air Force -- Black and Gold, the Long Grey Line -- and the Scarlet Red Beret. I do not understand from where flows his strength, his fortitude, his courage, his generosity, his humility, his intrepidness -- their source, and he, remain a wonderful mystery. Something happens here at West Point and my Dad loved it dearly. Dad, be at peace; your job is done. Ever off into the great mystery you go.